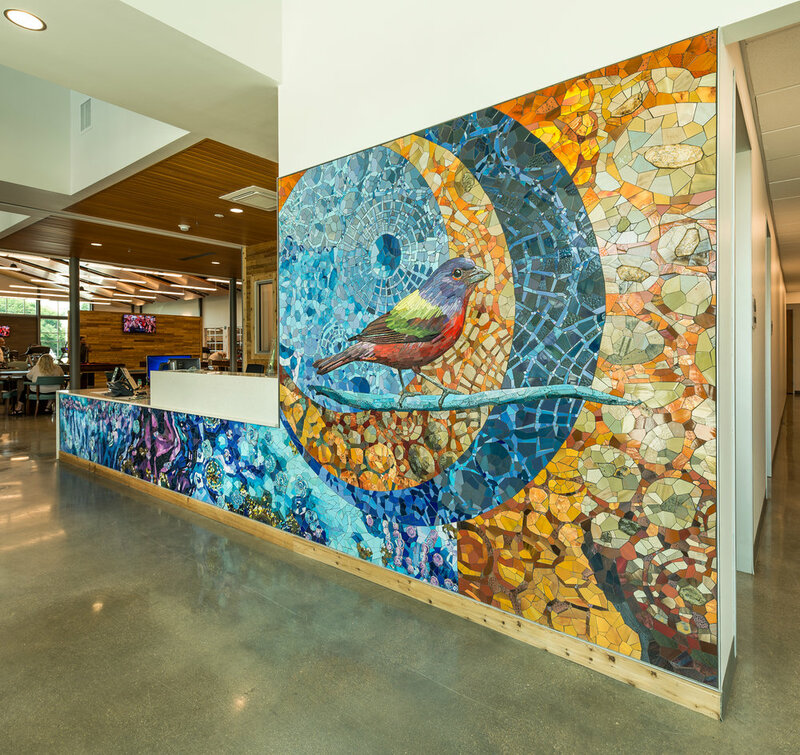 San Antonio Songbirds is a colorful abstract mosaic mural that welcomes the community to the new District 10 Senior Center at the City of San Antonio Department of Human Services. The mural depicts three native songbirds, the Black Capped Vireo, the Indigo Bunting and the Painted Bunting native to San Antonio on a larger than life scale with a surrounding "quilted" pattern of mosaics. Tile surface ranges from high gloss iridescent to rough textured hand made tiles in the complementary colors of rich blues to earthy ambers. Historical dates are stamped into handmade tile that creates branches. As one steps back from the mural, the dates become the texture of the branches. Although some of the dates mark tragic events, the memories recalled are not so much the event, but where the person was, what they were doing. The dates become personal markers with different associations for each person, sparking conversation and discussion.